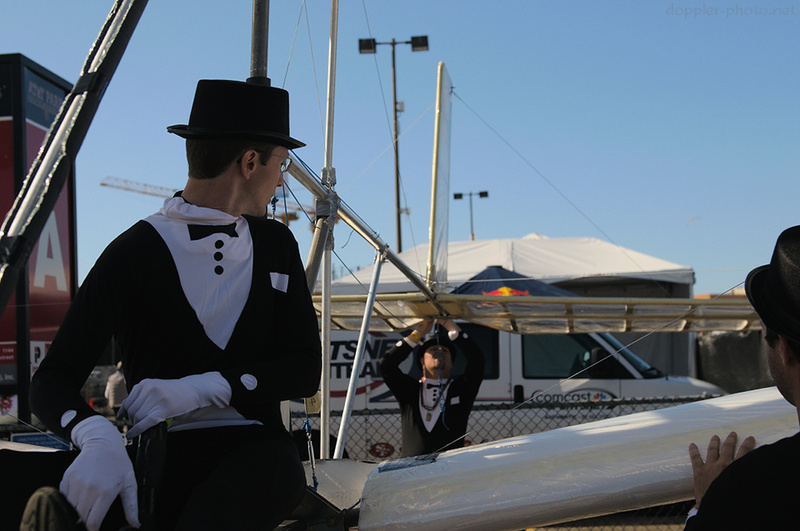 After literally years of anticipation, I finally attended my first Red Bull Flugtag this past Saturday, November 10th. The sun was out, the aircraft had a light headwind, and visibility was clear. That is, conditions were perfect for the teams to fly straight downward and cannonball into McCovey Cove. 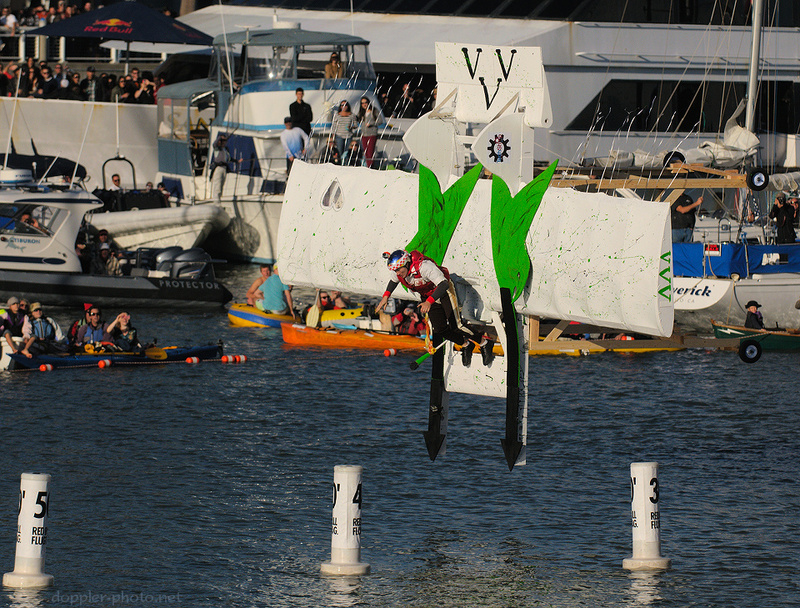 For those not familiar, Flugtag ("fly day" in German) is an event that invites people to design and construct purpose-built flying (and/or falling) machines, to be judged on some unpredictable combination of distance, creativity, and showmanship. 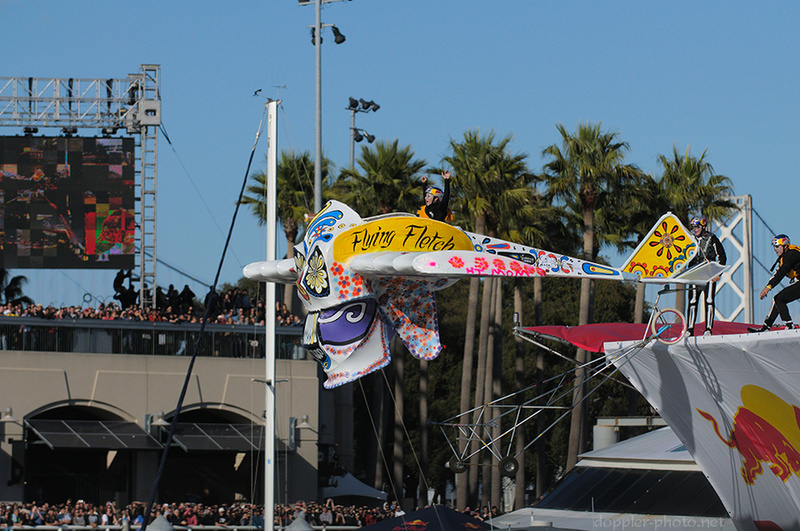 The Flugtag world record of over 200 feet illustrates the distance that a well-engineered, well-flown craft can accomplish. What I saw on Saturday, though, was essentially a demonstration of how stylishly a craft could trip off of the edge of the flight deck and casually face-plant into the water. The event started off with lofty ideals and delusions of grandeur. 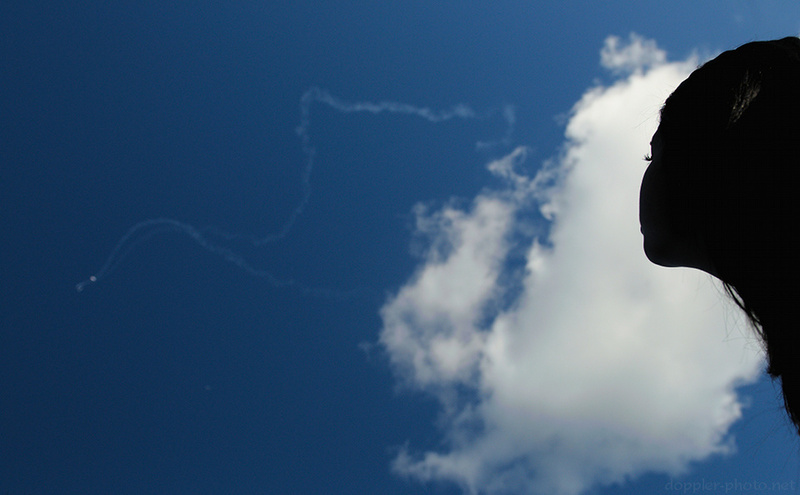 As the MC directed our attention skyward, two skydivers from the Red Bull Air Force descended in a graceful and utterly controlled manner, beneath well-designed and well-constructed parafoils that were tried and tested. As the poem goes, though, "even the best laid plans of mice and men do oft go awry." And after the two skydivers stuck their respective landings, the era of "tried and tested" was well and truly over. The crowd seemed to have a great time throughout the event (as did I), and many of the competitors seemed to put all of their enthusiasm into the competition, but as an engineer, I was admittedly a bit saddened by how few of the craft managed to glide any appreciable distance. The hangar area was open for two hours before the competition, which officially started at 13:00. Toward the end of that preview period, the teams that had built flying (rather than falling) apparatus could be seen checking their flight surfaces and generally preparing to give it their best shot. Despite this preparation, many of the aircraft (or launching devices) encountered malfunctions which restrained their distance. 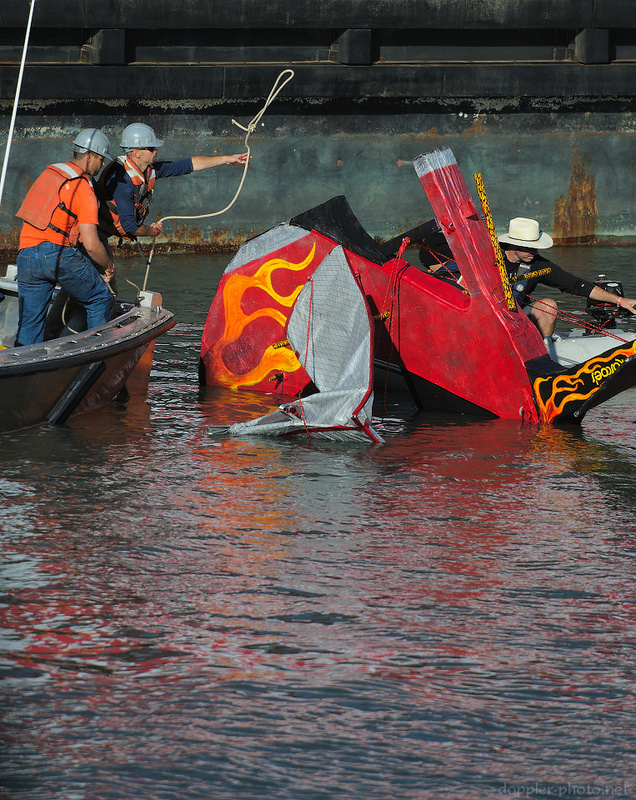 For instance, the Flugtag Barons (pictured) had a well-engineered biplane, but from what I could tell, their rolling launch platform failed to fully detach from the plane after it left the launch deck. The plane managed to drag the launch trolley along in a surprising feat of aeronautic stability, but it landed well short of where it might have. After the preparation, the flight attempts began. There were generally two types of craft: those with aspirations of flight, and those that really didn't have functional wings. 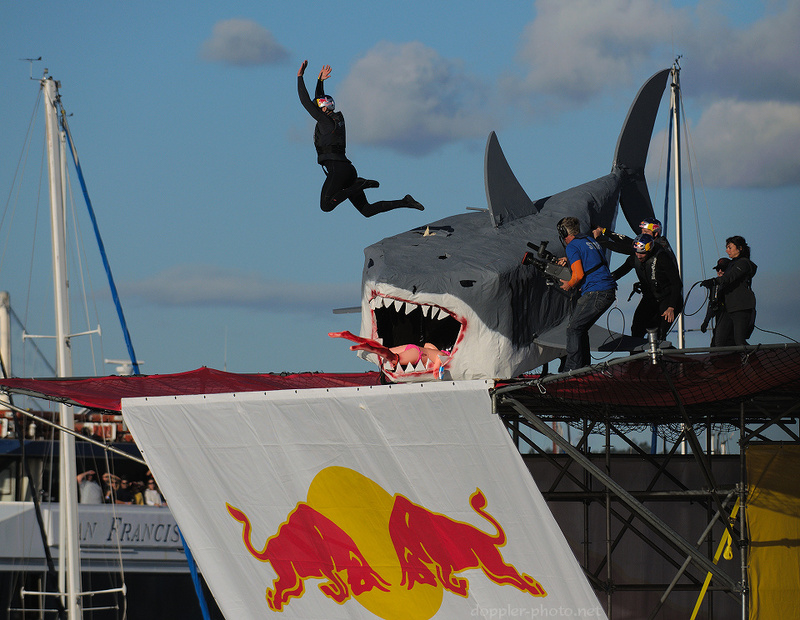 In the photo, the pilot from The Nine Amigos team leaps off of their shark-themed craft as a wheel fails at the edge of the launch platform. All of the team-members are Coast Guard helicopter rescue swimmers, which inspired their theme. After each attempt, the event staff made quick work of clearing the landing area so the next team could go. With help from the SF fire and police departments, the turnaround time was quick enough to not break the momentum of the event. In the photo, a member of the cleanup crew attempts to lasso a large, red, stiletto heel craft that was piloted by drag queen Frida Lay of the Chicago-based team Hell on Heels. Every once in awhile, though, the stars would align and a well-designed, -constructed, and -flown craft would carry on for a bit of distance. In this case, it happened to be one that also had fantastic decorations. Team Sugar Skull 138 flew a día de los muertos-themed craft to a second-place finish. When all was said and done, only a handful of craft made it anywhere close to the 40-foot mark, which makes the 200+-foot world record mark all the more impressive. Perhaps it simply goes to show just how difficult it is to build something that will defy gravity for such a distance. Even so, as the movie Toy Story reminds us, when you can't fly, you can still fall with style.